The Christian gospels of Luke and Matthew have long described how Jesus was born in the town of Bethlehem in Judea. However, we have no way of really knowing whether he was born in a house, inn, stable or cave? Where does all the confusion stem from? How do we come to an agreement, as to what really happened? If we refer back to the gospels for clues, Luke 2:7 asserts that Mary “laid him in a manger because there was no room for them in the inn.” It is interesting how generations have chosen to interpret this line. For instance, is it logical to assume that a manger would be found in a stable or barn? When I was young I was told stories about how Mary and Joseph, who were turned way by an innkeeper, found refuge in a stable, where Jesus was born and laid in a manger. 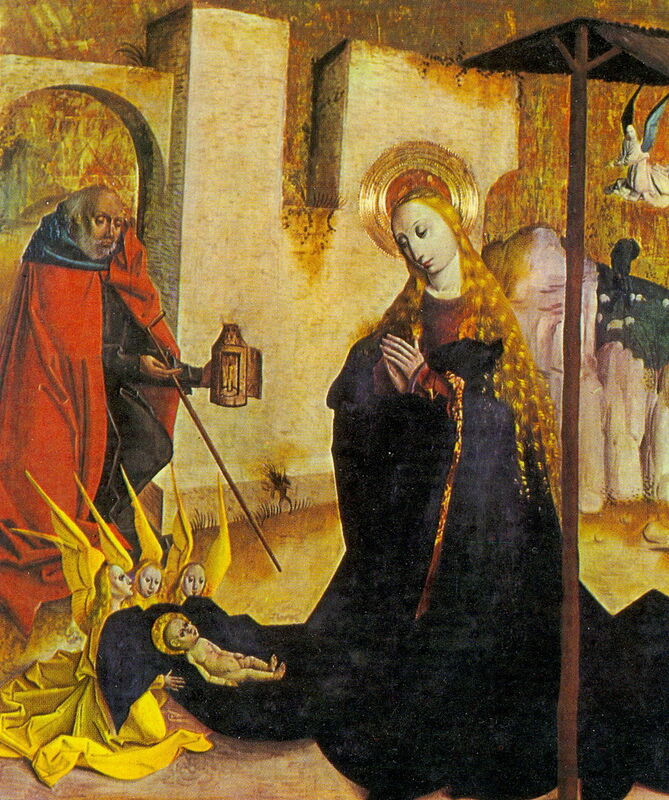 Untold images of paintings, mosaics and displays of the Nativity have reinforced this assumption, showing Mary and Jesus in a barn or stable, often in the middle of nowhere, with the star of Bethlehem perched over it. This nativity scene, like so many others, depicts Jesus under the roof of a stable in the middle of a field. This nativity scene by an unknown artist, shows Jesus and Mary in a stable just outside the city walls of Bethlehem, c.1490. The gospels according to Luke or Matthew do not tell us where this manger was, so as I have said we are left to make our own assumption about. Could not this manger in fact have simply been a domestic stable that was attached to the inn mentioned by Luke? With so much written and spoken about the birth of Christ over the centuries, it is feasible that Jesus could have been born within the grounds of Joseph’s ancestral home. When Joseph and Mary arrived in Bethlehem for the census, they could have easily stopped by his ancestral home for shelter. However, as we already know, when he arrived looking for a place to stay, Joseph and Mary were turned away by relatives because the ‘inn’ or house was already full of elder members of Joseph’s extended family. As a result, Joseph moved the heavily pregnant Mary into the ancestral stables that were most likely attached to the house. Wait a minute, but didn’t an innkeeper not Joseph’s relatives turn them away? Remember that Luke does not mention an innkeeper at all. Our assessment of the biblical story surrounding Jesus birth and the nativity is subjective and open to interpretation. It would be logical to assume that an inn has an innkeeper. If we are to assume that Jesus was born in a room or guest chambers (inn) outside the main ancestral house, what sort of place was it? Often caves were present near or beneath the main living quarters of houses in Palestine, where animals were regularly kept during the night, safe from harsh weather and thieves. In caverns, people and animals often shared these spaces for various reasons, while sleeping quarters were found on upper levels of the main house. Therefore, the idea of a cave being the place of Jesus birth has merit. 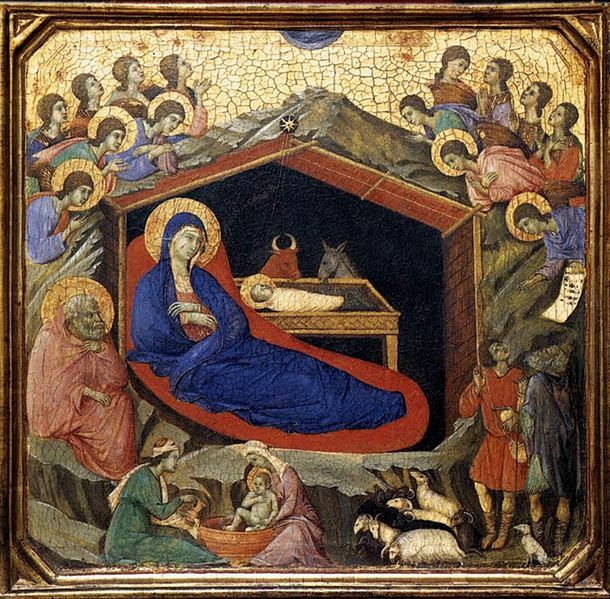 Duccio’s alterpiece (the Maestà) 13th century, has this wonderful nativity scene, which appears to be a compromise stable-within-a-cave. 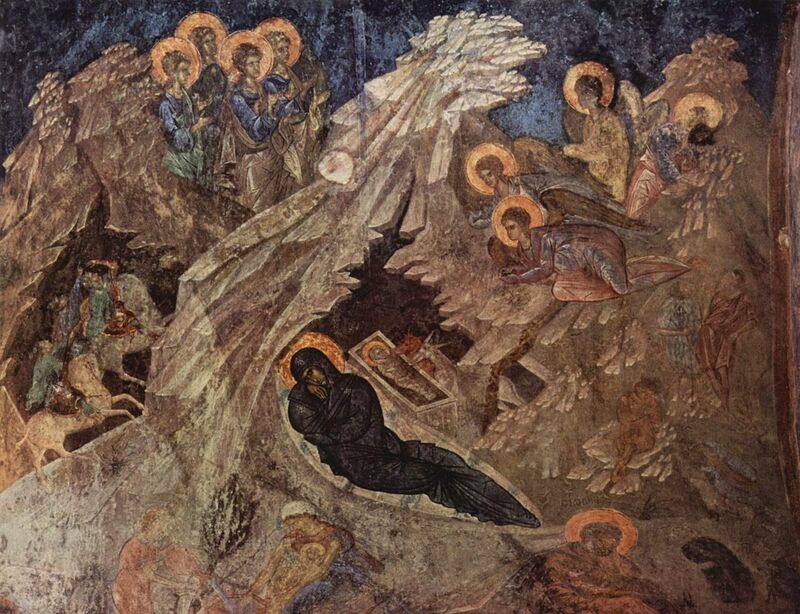 In another variation of the nativity, this interesting Byzantine fresco from Mistra, shows Jesus lying in a manger with Mary sleeping besides him, in a cave setting. 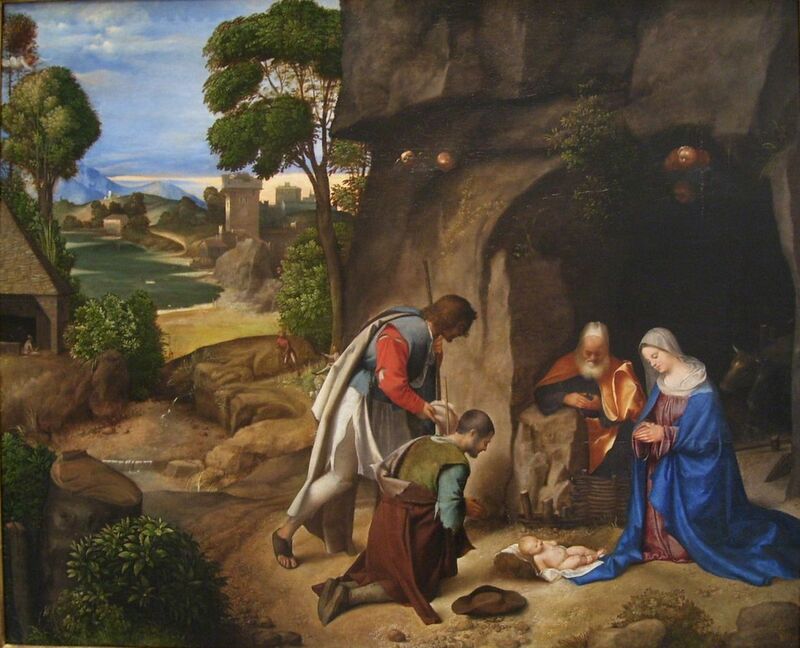 High Renaissance artist Giorgione’s nativity shows Jesus adorned by shepherds in this cave setting. Traditionally the identification of a cave as Jesus place of birth has been celebrated through stories and by written word for almost two thousand years going back to the middle of the first century. The writings of Justin Martyr in the second century (circa100-165) interestingly also describe how Joseph found a certain cave and brought Mary there to give birth to their son Jesus, placing him on manger. We should not rely upon this account as fact, but we cannot also hold it in contempt as downright fiction? Legend states that early Christians, possibly on the advise of Justin Martyr, began to commemorate around a site in Bethlehem with a recessed cavern or grotto.However, as word spread, the Emperor Hadrian wasn’t too pleased. In an attempt to desecrate the site, he built a temple in honour of Adonis and planted a grove of trees over it. In a sense, the temple became a marker for all Christians, in the hope that in the future, they could pay homage once again to Jesus birthplace. Two hundred years later under the supervision of Emperor Constantine’s mother, Helena, the Church of the Nativity was built around the same grotto believed by early Christians to be the site of Jesus birth. In 339 AD, the first Church of the Nativity was dedicated and later replaced by a bigger church by Emperor Justinian in 530AD. This church has survived intact, modified and built upon over the centuries, as a symbol of the site of Jesus birth. 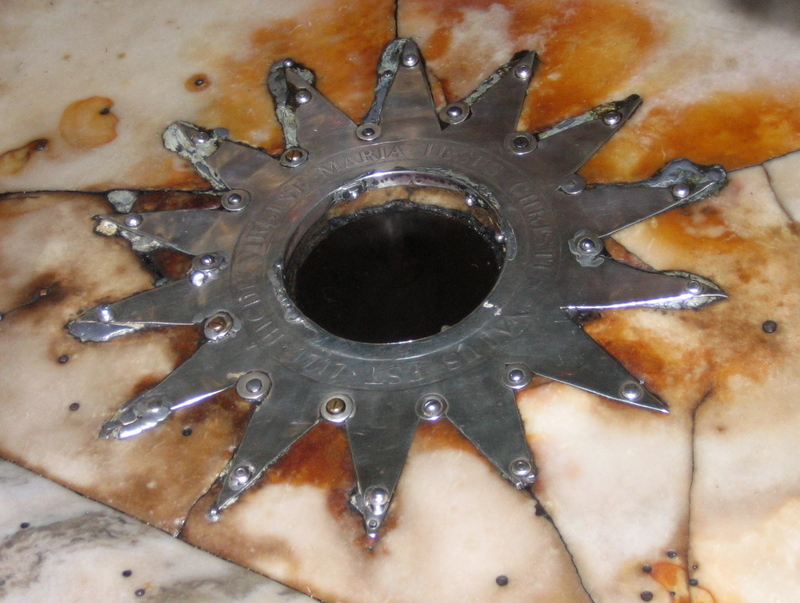 Interestingly today, beneath the altar in the grotto of the Nativity, lies a fourteen-point silverstar, that traditionally marks the spot believed to be the birthplace of Jesus. I suppose whether or not the fourteen-point star beneath the altar on floor of the Nativity is the actual spot that marks Jesus’ birthplace is debatable. Nonetheless, it is symbolic in importance to millions of Christians. It fundamentally connects Christians to the tradition that Jesus was born in a cave. Looking at this from a’ half glass full’ point of view, there is no real reason why we should totally disregard it. The fact remains that Jesus according to the scriptures was born in Bethlehem. Luke doesn’t elaborate where this occurred, it probably wasn’t important. In my opinion his point was to say that Jesus was born in humble circumstances in a manger. Photo credits: All images used here are in the public domain. The header is a nativity scene by Giotto that sees the infant Christ being placed in a manger, underneath a roofed structure set into a rocky outcrop. *This article was first published on December 14th 2015. Great, timely, post. I think with the Gospels and with Biblical stuff in general, people are generally on shaky ground when they try to confirm historical facts or accuracies, as there is in reality very little that can be historically verified. Though of course it’s still fascinating to explore. I’ve read some strong cases that Jesus might’ve actually been born in Nazareth and not Bethlehem at all; and that the Bethlehem narrative was added later by the Gospel authors to emphasise Jesus’s messianic authenticity by association with King David. Yes, I have read those reported cases that talk about Nazareth as a possible birth place of Jesus. Interesting. As with a lot of things that involve religion, it’s subjective, particularly when evidence is scarce. What’s also fascinating is that Jesus’s birth-date was several years off to because the man who originally calculated it – Dionysius, I think? – got his calculations a few years off for the simple reason that he forgot that ‘Augustus’ had also ruled a few years as ‘Octavian’. Thus he counted Octavian and Augustus as two separate people.